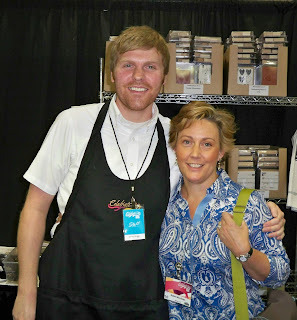 Trinity Designs: Fun Convention Photos! I promised yesterday to show you a picture of Brady, my SAM from last year, so here he is with me on check in day. 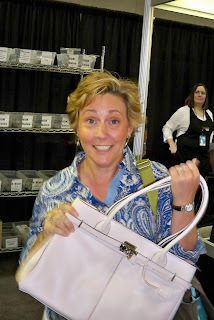 The next picture is just priceless though, it's my incredulous look just after Brady told me I'd earned Founder's Circle and gave me that GORGEOUS Pink Leather purse! Wahoo! I'd have bought the purse anyday - never mind the award! It's even lined with fabric that matches the new Bella Rose Designer Series Paper! How cool is that~! Founder's Circle is a special trip that is earned each year by achieving certain benchmarks in your business. It is hosted by our CEO, Shelli Gardner and the Top 135 demonstrators in the company are invited to participate. This year's Founder's Circle trip is to St. George, Utah and is for 5 days in September. We get to relax, hang out by the pool, stamp special projects with NEW stamp sets - yes, even more new stamps! We get to take a day trip to the manufacturing facility in Kanab, Utah and see the entire process of producing the finest rubber stamps in the world! That is really cool! We swap with the other demonstrators on the trip and this year - I've even made an appointment at the spa! Some of the gals are booking a hiking trip, but funny how that just doesn't seem relaxing to me! Ok, if you know me, you know that's not really funny.........well, maybe, now that you are reading this. Anyway, I went thru all that to say how grateful I am to have earned this recognition for the 2nd straight year. God is so good, and He has blessed me tremendously with you all who are part of this fun job that I love so much! And you know what else? I've been blessed to meet and make friends with some of the best gals anywhere! Here is a picture of me with Lisa Somerville (L) and Lisa Bohler (r). They are two of my best demo friends and here we are having dinner with about 30 other stampers at PF Changs. 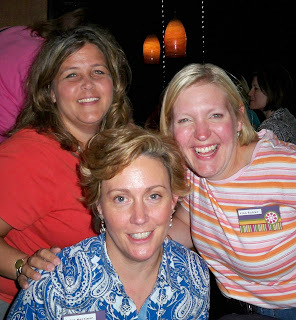 You may recognize my Lisa friends from their fabulous blogs if you look at the Bloggers Challenge players each Friday. Ya know, being a demo has a lot of great benefits whether you do it for the discount, for the paycheck or just for the sanity. But, by far, the BEST benefit is the untradeable friendships you make with stampers everywhere you go. I really love this job and I wouldn't trade it for the world!